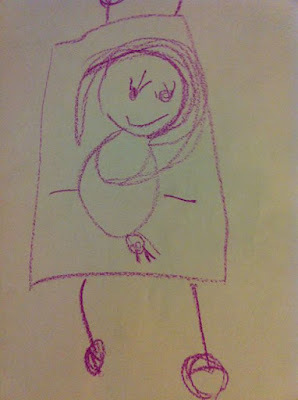 Indigo drew this picture for me yesterday. She told me it's me, laying on a bed, having the baby. I realize it may look like I have tail feathers. Nope, that's the baby. And look, I'm smiling. That might be my favorite part. Can I admit that I find this picture both really funny and oddly inspiring at the same time? This morning I asked Indigo if she thought I might just be pregnant forever. She assured me that babies always come and that no baby has lived inside his or her mom forever. Then she added that she was sure the baby would be born by December 21st. I am thinking your hair and makeup (long lashes) are a compliment to your radiant smile. The baby is already out so you are smiling! I love that your hands and arms are ready to catch/hold the baby! Seriously Rachel, this is frameable art! Maybe not for the family or dining room, LOL, but certainly for your room somewhere. PRECIOUS and so much thought and feeling in the drawing. It really incorporates a lot of your feeling this pregnancy you have posted on the blog. Thanks for sharing. THough Indie may not think so when she is 15 years old, lol!